Vail Resorts employees volunteer on their day off to collect school supplies for children in Summit County. Back to school means big yellow buses, but a van recently helped some Summit County schools — not by dropping off kids, but rather, school supplies. Vail Resorts Echo and the Summit County Employee Giving Council partnered with the Family and Intercultural Resource Center for a school supply drive earlier in August. 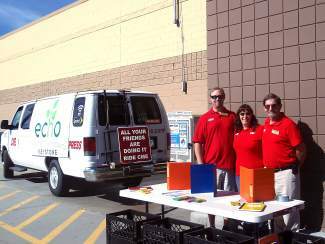 The goal was to fill a Colorado Mountain Express van with helpful items for local schools in need. Vail Resorts employees volunteering outside the Frisco Walmart gathered supplies worth more than $600. Ashley Sale, account sales manager for Colorado Mountain Express, helped organize the school supply drive. Sale is also a member of the Vail Resorts Echo team, and said he was proud to be supporting local students. The volunteers collected donations such as Kleenex, markers, notebooks, crayons, pencils, lunchboxes and backpacks. All of the supplies went directly to schools in Summit County, where students returned to school two weeks ago. Sale said Vail Resorts is looking forward to partnering with the Family and Intercultural Resource Center and the Summit School District again soon.